bit of unique shopping from Chowk, Divine weaves & arts, Sliver stone and Lifestraw ! Quote from Dr Shanti Auluck, Founder member & President of Muskaan "The main aim of the event was to create awareness about the work being done by Muskaan in the field of intellectual disability amongst the community. We hope the musical afternoon was enjoyable and we look forward to hosting events of similar nature in the future." "Muskaan", a voluntary "not for profit" organization came into being in 1982 when a group of parents and professionals came together because they were dissatisfied with the absence of services for children with special needs. Today, Muskaan has grown as a premier institute in Delhi providing comprehensive education including vocational training and work opportunities. They advocate for the rights of those affected by intellectual disability as our society by and large still fails to recognize their human potential. Muskaan has realized their efforts could not be limited to training alone; it had to be followed by employment irrespective of levels of ability. Thus, a work centre was started to provide work opportunity to the trained graduates. Today more than 250 products are made at the centre. The trainees not only put their skills to use but also begin to earn their own money. 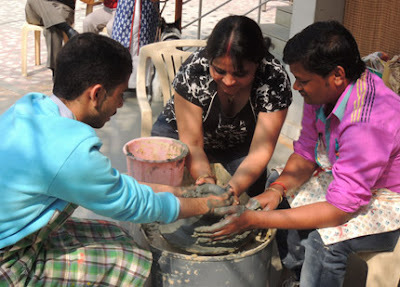 In Muskaan’s busy, bustling campus in Vasant Kunj, young men and women can be seen working hard every day, making an impressive range of products of the highest quality. The products are marketed with orders coming in from various organizations. Traditionally, the trainees have worked within the centre but it was always believed that greater integration with mainstream society will enable them to fulfil their true potential. Some of their higher functioning trainees have gone on to take up jobs in the service industry, proving themselves to be diligent, conscientious employees. Muskaan has found that regular employment transforms not only the lives of people with intellectual disabilities, but also proves to be a great humanizing experience for the people who work with them.